Picture Day is this coming weekend! The schedule has been finalized. Please read through this so we can make picture day a success! All pictures will be taken at Dominion High School near the turf field (rain location- Main Entrace to DHS). Picture envelopes will be delivered to your coaches this week. Please make every effort to complete your order envelope prior to your arrival on your scheduled day and time. All teams must arrive 5-10 minutes prior to their scheduled time so coaches can get them lined up in height order. It is crucial we follow the schedule as many of our teams will need time to travel to their away games. We plan to set up a Spirit Wear table at pictures as well. We need at least 2-3 volunteers each day to help with this effort. If you are able to volunteer please email Marty MacKay at . Thank you for your cooperation in making Picture Day a success! We are excited to announce the opening of the Tribe Team Store! This year, we have partnered with Squad Locker to provide a new option when outfitting your family for the upcoming season. The new platform allows you to shop anytime and have items delivered directly to your door in just 2 weeks! The store will remain open year-round. We’ve included gear for the whole family from brands like Under Armour, Nike, and others with many styles and colors to choose from. Items will update from time to time. Some additional highlights include player name/number customization, real-time sizing, express order production, and online order tracking. 2. 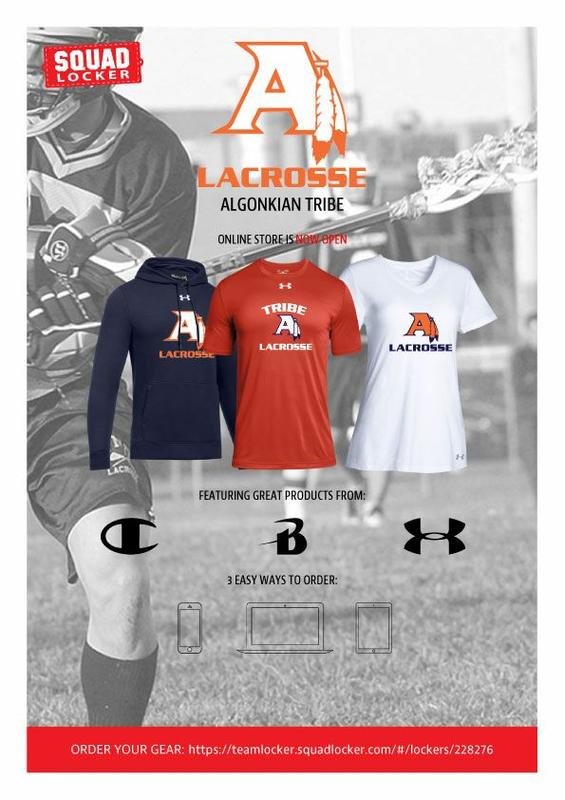 Or visit team.squadlocker.com, Click on “Find Your Store” and type “Algonkian Tribe”. We hope you enjoy the new Store! We are looking forward to the Spring season and seeing you all out on the fields with all your fresh, new gear in support of the Tribe! We love feedback; reply to spiritwear@algonkianlacrosse.org with all your comments and ideas. Thanks!